Fancy rugs. This collection was inspired by the beauty and popularity of sisal rugs. The Fancy collection fuses sisal rugs and gobelin tapestries by simply using gobelin as borders and multiple weaves and textures in each rug. The borders range from traditional and floral to casual and modern. Fancy rugs are made in Egypt from Olefin Sisal look polypropylene, the borders are made from a mixture of chenille, polypropylene, acrylic and cotton. 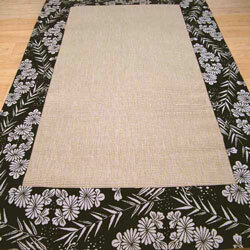 Fancy rugs are made in 3 sizes including a large 200x285cm size.